We have been looking forward to our trip to Bluestone for months! 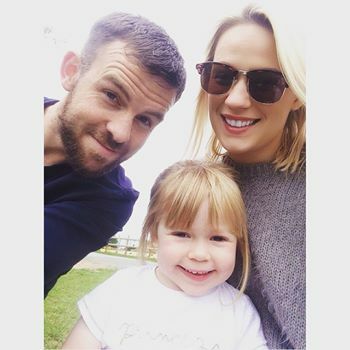 After seeing so many fellow mummy bloggers experiencing it I couldn't wait to head to Pembrokeshire with Nath and Ava for some time out. After our crazy busy last few weeks this break is very much needed! I hate to admit it but we were horribly unorganised this week, all packing was left until the last minute, meaning that after having to turn back home twice (after forgetting things), stopping for lunch and a food shop at the big Tesco in Camarthen, which is the closest supermarket to Bluestone Wales (definitely recommended as all lodges are self-catering), we didn't end up arriving in Bluestone until 5.30pm. Check in is so easy, no faffing about with parking up and getting out of the car. You simply drive up to a window and check in from the comfort of your car. Genius. Bluestone is a car free zone but you are allowed to drive your car down to your lodge to unload but must put your car in the car park by midnight. First impressions were amazing, living in Shropshire, we are used to the gorgeous, rolling green hills but it feels different here and at the risk of sounding like a massive cheeseball, it feels so peaceful and serene! I feel like we've left our hectic lifestyle at the door and we can finally relax! Bluestone is set in 500 acres of stunning Pembrokeshire Coast National Park countryside and we can't wait to explore! We are staying in one of the Caldey lodges which has a large open plan kitchen, diner and living area with high ceilings and lots of room for excited toddlers to roam and play, a large double room, a twin room and a wet room. I was slightly apprehensive about how Ava would get on with the wet room as she's never had a shower before but on the first night she was right in there! I was so pleased as I didn't really fancy flannel washing her for the duration of our stay! Linen is included, as is a travel cot but you need to bring your own cot linen should you need to use it, and although towels are included I'd advise bringing extra ones for the pool. You are also given a mini cleaning set which contains a mini bottle of washing up liquid, 3 dishwasher tablets, two binbags, a sponge/scourer and a cloth. My slight quibble was that there were no instructions for the microwave or dishwasher. It took us a while to figure out how to use the microwave and as we don't have a dishwasher at home I think I had it on the wrong setting as it didn't clean the dishes properly. After unpacking and giving Ava her tea we set off to explore our surroundings. Luckily the weather was still gorgeous and whilst driving around to find our lodge we spotted the outdoor play area, Ava was beside herself with excitement so we just had to have a play. Nath and I remarked how clean it is everywhere. Bluestone pride themselves on their environmental responsibility be it from using natural, sustainable materials to solar-heated water in some of the lodges. Bluestone's efforts have not gone unnoticed as they are the proud recipients of numerous awards. We also took the opportunity to have a look around the village. It has it's own shop, pubs, restaurants, even a bakery. We've booked the Farmhouse Grill for tomorrow night, it looks very family friendly in there so we're looking forward to it. We decided to have a night in tonight, after the long drive we're all pretty tired. I've made Nath and I some fajitas which we've enjoyed with the rest of our bottle of prosecco. 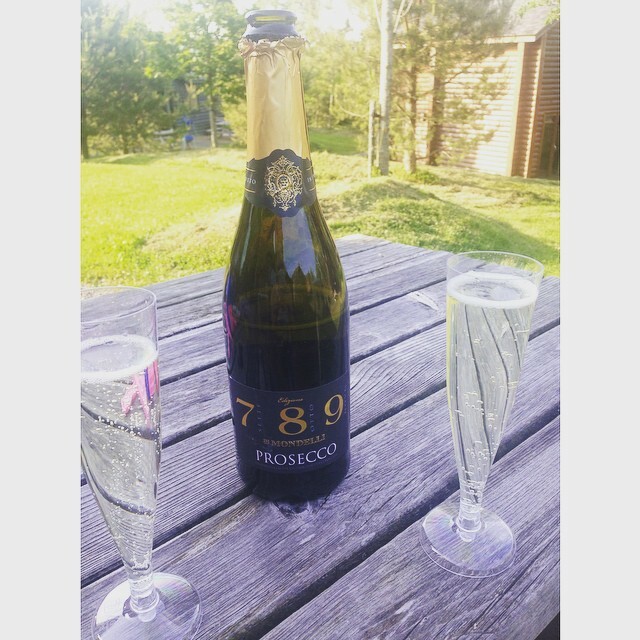 We bought it months ago and said we'd drink it when we finally completed on the house. It feels pretty special to drink it here though, I'm so excited for the next few days! I slept quite well considering I'm usually a super light sleeper, I'm one of those people who always wishes they'd bought their own pillow from home as I have a bit of a dodgy neck. I found the ones in the bed a little too firm but I managed to squish it down a little. I ended up sleeping on my own as Nath was exhausted and he fell asleep in Ava's bed. This meant that I didn't get disturbed until 7.00am which was nice. I woke myself up by having a lovely, hot shower, top marks on the power shower. I can't stand measly, dripping showers but this one was great. I then got ready to pop to the village shop as it opened at 8am and we were in desperate need of teabags and juice for breakfast! How we managed to forget those things during our big food shop is beyond me! Ava didn't want to join me on my walk but strolling through the lodges was lovely and quiet. The smell from the bakery was amazing, we'll definitely be going there tomorrow morning! I cooked a big breakfast of bacon. 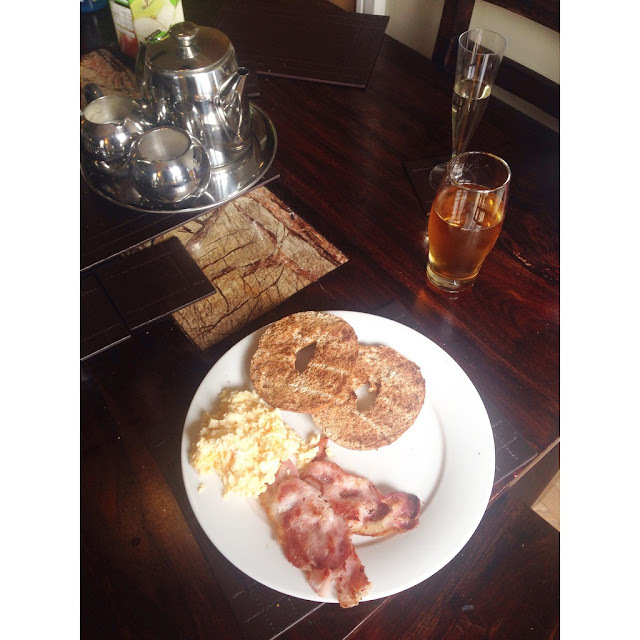 wholemeal bagels, scrambled eggs and beans. We'd planned on visiting Tenby beach but after checking the forecast it didn't look like the cloudy weather was going to improve. As I also had tickets to Folly Farm we decided to go there instead. I'll be doing a full, separate review on Folly Farm but it was a fantastic day out. There was something there for everyone, we chose the perfect day to go as it wasn't too busy and the weather stayed dry. We were hoping that Ava would nap for a while after Folly Farm so that we could unwind in the lodge before dinner but that didn't happen. 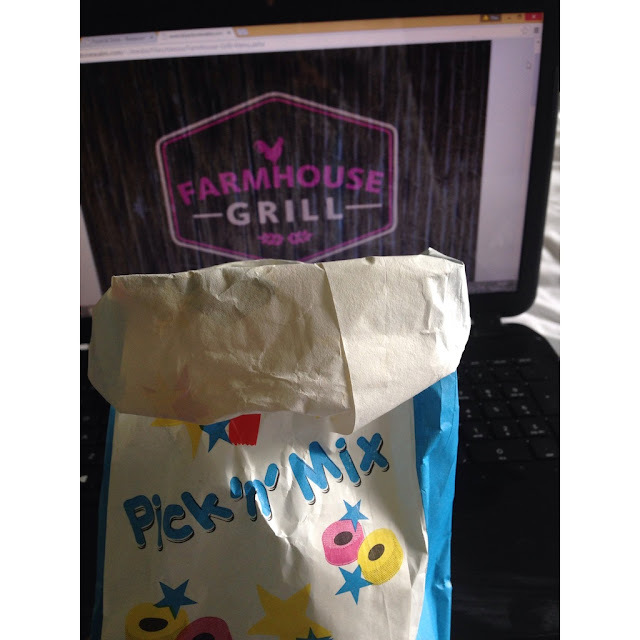 I ended up eating a whole bag of pick & mix to myself and felt absolutely sick afterwards, I'm seriously such a pig. Before dinner we went to The Knights Tafarn which is the pub in the village, we had a drink in the beer garden and Ava played in the outdoor treetop play area. Our booking at the Farmhouse Grill was for 7.00pm, it wasn't very busy but I put it down to the Oak Tree restaurant, opposite also being open. When we'd booked the previous night it was heaving so I wasn't worried. Nath and I shared the nachos to start and Ava had the macaroni & cheese which she seemed to enjoy. Nath had the Farmers Mixed Grill as his main he said that it was nice but his steak was quite chewy, I chose the Seabass, mushroom, cider & garlic risotto which was gorgeous. We skipped pudding as I was still feeling pretty sick after scoffing my sweets! Ava had only had a 20 minute nap all day so we decided to go on an evening walk to try and get her to sleep. We took a walk around the lake which was teaming with wildlife, there were baby frogs all around us, rabbits in the grass and even a mother duck, waddling to the pond with her ducklings in tow. Safe to say Ava didn't go to sleep. Tomorrow is meant to be the wettest day so we're planning to go to Blue Lagoon water park and Ava is booked in to messy play at 1.30pm. It should be another fun filled day! 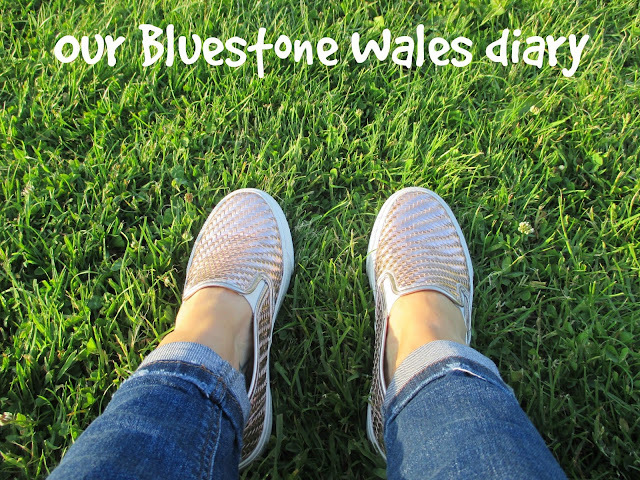 *We were invited to Bluestone Wales for a 4 night self-catering break free of charge in exchange for a review. Thoughts are 100% my own.